This is one of a set of three photographs showing the same spheres with different lighting conditions. 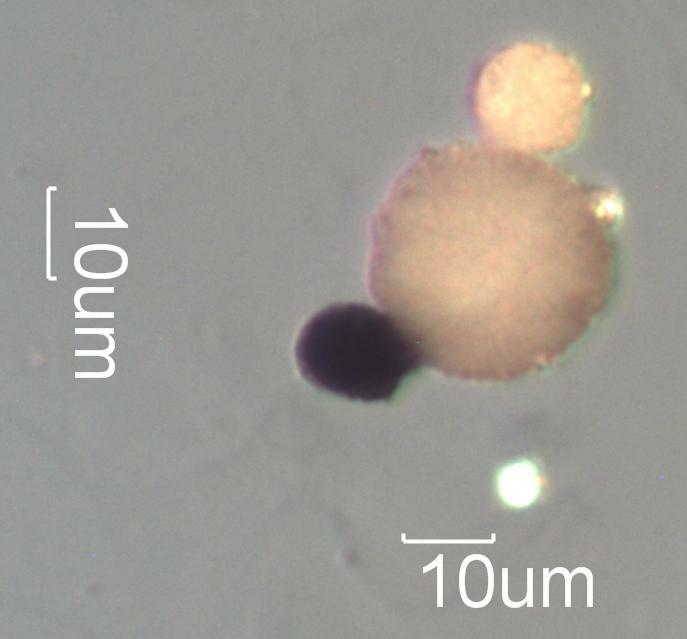 This shows the reflectivity and transmittance of these three paint spheres. One paint sphere is black and quite opaque. The other two are basically white with the smaller sphere transmitting more light. Limestone (calcite) bulking agent particles can be seen slightly protruding from the white spheres. The greyer appearance of the larger sphere is due to less light scattering through the particle because of its greater thickness. This is from an environmental tapelift collected in a home.